Here we are with another gift beer. Coming to me from Vault Brewing Company in Yardley, PA by way of a pit stop in New Jersey I ended up with another stout to share with you all. 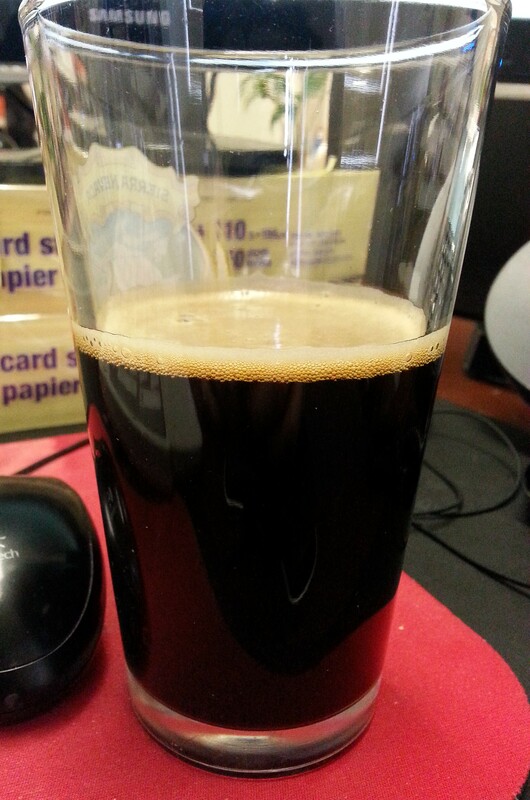 Description: Poured into my trusty Bean Porter mug from a refrigerated nitro can. Said can was dated 02/08/2016. Appearance: Being nitro, the instructions were to pour aggressively and I was happy to oblige. The beer had dark yet distinctly brown body topped off by one finger’s worth of a foamy white head that filled in as the beer settled. Smell: Very subtle creamy coffee. Taste: Light roast coffee throughout with occasional hints of sweet malts that served to give the beer a nice creaminess. These taste were fairly mild but had a pleasingly steady presence from start to finish. There was absolutely no hint of the alcohol at all; I would not have been surprised to find out that this was only 5.0%. Mouthfeel: Thin and light to start, but by the finish it took on a rather smooth and creamy quality. Very low carbonation and super easy to drink. Perhaps even dangerously easy to drink given how well the alcohol is hidden. Hype Factor: Seeing all the Untappd check-ins at Vault Brewing certainly piqued my curiosity, but I had no real preset expectations going into this one. I knew I wouldn’t be offered a sub par beer, but beyond that I did not know what I was in for. Overall: This was a very good beer and a pleasure to drink. I certainly wish I had a few more to sit back and relax with, and would have really enjoyed a chance to try it side by side with a similar brew I recently enjoyed – Kent Falls Table Porter. My adventure in reading continues, this time with another book by perhaps my favorite author: Haruki Murakami. Colorless Tsukuru Tazaki and His Years of Pilgrimage was first published in early 2013 for the Japanese market, while the English version I read came out in mid-2014. Going in I had read just about every piece of Murakami’s fiction available in English, so this one had been high on my reading list since it was released. This book was the story of Tsukuru Tazaki, an engineer in his late-30s living in roughly present day Tokyo. Through conversations with his girlfriend Sara and a series of flashbacks, we learn that he has spent a large part of his life struggling with feelings of emptiness and depression as a result of an incident that occurred some 16 years ago. Growing up in Nagoya, Tazaki and four of his classmates comprised a close-knit, inseparable unit of friends that came together early in their highschool years. Some time later, during his second year away at university in Tokyo, Tazaki was informed out of nowhere that the other four group members were severing all communication with him, no reasons or explanations provided. With Sara’s urging Tazaki feels he is ready to seek out and confront his former friends about the past and get the closure he needs to move on with his life. I really enjoyed this reading experience, but man was this a heavy book. The overall tone was rather dark, as Tazaki’s moods don’t vary far outside the range of passively suicidal lows to “highs” of mild acceptance of, and resignation to, life. It was never overly dramatic, but the mood simultaneously weighs the reader down and pushes them forward. 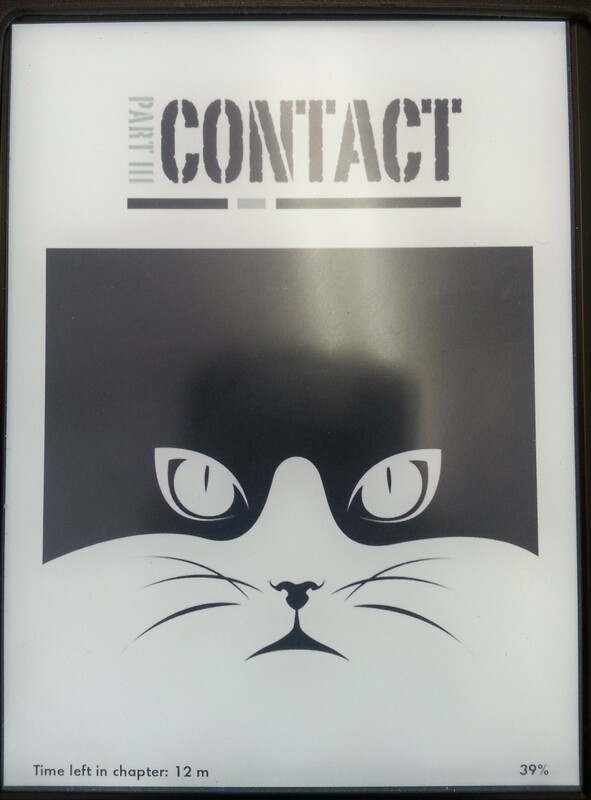 While the book did do a good job of getting the reader hooked from the beginning, I found that I got more and more engaged as the story went on. By the middle, it had built up a lot of momentum and went by very quickly as it neared the end. As I approached the final pages, I started to get very anxious about what the outcome might be and what sort of closure the reader would get. The story had slowly built up to such an intensity, that I didn’t fully realize it until I finished the last page and would have done anything to have gotten more. This sense of involvement was developed by Murakami’s fantastic ability to tell a story and the strength of Tazaki as a character. True to his form, Murakami fully engaged the reader’s senses as well. Colors play a big role in the story and hint at tensions between the characters. In Tazaki’s original group of friends, the two boys were “Red” and “Blue,” while the two girls were “White” and “Black.” Unique among his group, Tazaki was the only one who did not have a family name that signified a color and instead saw himself a colorless vessel into which the others expressed themselves. Music also featured prominently in the story, in particular Franz Liszt’s Années de pèlerinage. Of course a record player was involved, as was a mysterious traveling pianist. As for Tazaki, himself, despite not being the most charismatic or engaging person, he was none-the-less a fascinatingly likeable and approachable character whom the reader wants to follow along on his journey. Another thing that stood out to me while I was reading was that for all of its stylistic familiarity, the book had something of a different feel to it than most of the other works I had read by Murakami. Now that I think about it, there were two key elements that contributed to this feeling. The first was that there was less of the author’s usual mysticism present in this story. That’s not to suggest it wasn’t there, but unlike in some of his other works, most of the story and conflicts played out either physically or psychologically in the real world. I think this was a good choice, as it made the story that much more foreboding. The other thing that felt different was that this book took place closer to present day than any of the other Murakami novels I have read thus far. Characters having access to things like email and cell phones seemed almost out of sorts with the types of worlds I’d grown accustomed to in these works. I always think of his characters inhabiting a mysterious otherworld of 1980s apartments and smoke-filled jazz bars, but again, it just seemed to feel right having these characters occupy a more modern world. I am really happy I took the time to read this book, and would readily recommend it to others as seasoned Murakami fans and newcomers alike can enjoy it. Just don’t go in expecting something lighthearted. Yesterday I swung by Night Shift Brewing Company to attend their Fourth Anniversary party. They were celebrating in style with a bottle release, plenty of food, and, of course, lots of great beer on tap. The event rather quickly turned into a full house, though by arriving a bit early (with my trusty Kindle in hand!) I was lucky enough to get inside in time to grab one of the 250 bottles of their anniversary brew being released. With spring now officially upon us, I certainly appreciated it being a barrel aged stout to enjoy on the last day of winter. There had originally been a DIPA slated for release at the party as well, but that was still a bit too green and needed more time in the tanks. I am sure that will make an excellent beer in the very near future, but my focus all along was on the stout. 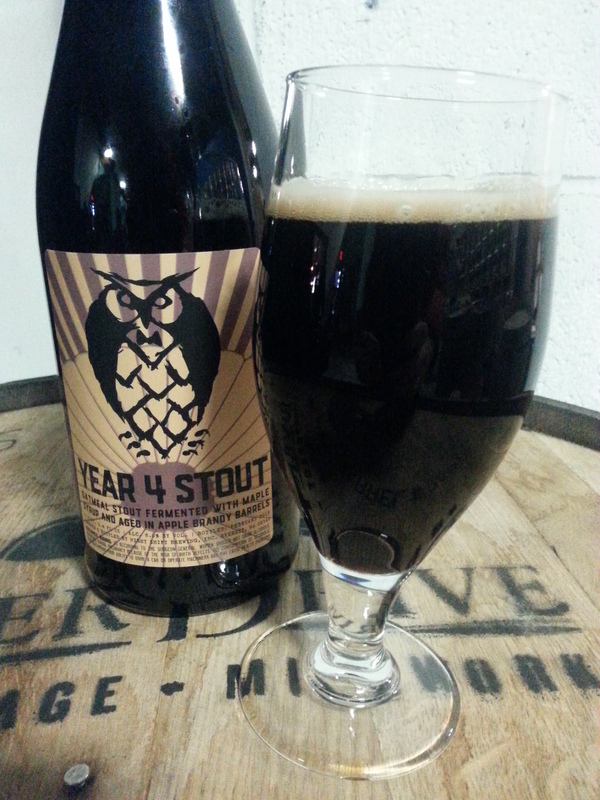 Description: An oatmeal stout fermented with maple syrup and aged in apple brandy barrels. Label says it was bottled in February. Appearance: Poured a dark black body with a bubbly head that was colored somewhere between off-white and tan. Smell: Distinctly sweet and slightly hot, clearly influenced by both the maple syrup and the barrel aging. Taste: Delicious! The beer had a great hot brandy opening that came to a sweeter finish as the maple syrup came through. Rich dark malts were present throughout, making for a perfectly executed beer chock-full of sweet, malty brandy goodness. Mouthfeel: The beer was thick bodied and relatively low on carbonation. Perfect for the style and taste. Hype Factor: I’ll admit expectations were elevated on this one. Night Shift has been absolutely killing their barrel aged stouts and porters lately, so I was eager to try this one out. Overall: A fantastic brew and certainly one worthy of the brewery’s big day. Very nicely done. It’s a Duck, it’s an Elephant, it’s finally a new Beer Review! After an eventful week off, I am getting back into action with a beer that came to me as a gift from a friend in Northern Jersey. Right off the bat, I loved the can art and wished I had this one around last month while I was reading Pride of Carthage. Since you can’t judge a book or a beer by its cover, I opened it up at the end of a particularly long day hoping for a nice treat. Let’s see what it had to offer. Description: Described on the can as an “aggressive Double India Pale Ale loaded with juicy hops” that will assault you with the intensity of, well, a war elephant. Canned on 03/09/2016. Pour Info: Poured from a well-traveled 16 oz. tall boy can into my official glass of 2016. Appearance: It had a hazy, golden-orange juice-like body. Topping it off was a healthy white head that left nice lacing across the top. Smell: Citrus juice with piney hops lurking in the background. Taste: Lots of juice here as well. Started out citrusy upfront, then turned more tropical as the beer progressed. The finish was citrus zest and a mixture of fruity and piney bitterness from the hops. I found this beer a touch more juicy than hoppy, but these two aspects were in good proportion to one another and balanced each other quite well. There was a hint of the alcohol at warmer temperatures, but overall it was concealed by the juiciness. Mouthfeel: The feel was on the thicker side of what I was expecting and the carbonation was just a bit short of moderate. A rather smooth drinking experience where once again, the juice comparison seemed appropriate. Hype Factor: I had elevated expectations going into this one. Not only was I excited to get my hands on another Rushing Duck brew, but I was also really digging the art and wanting for a solid beer when I opened it up. Overall: This beer certainly did not disappoint. Although not as aggressively hoppy as the label might suggest, this was still an excellent DIPA and one that I really enjoyed. I particularly liked the juicy and hoppy flavor profiles and would no doubt drink more if the opportunity came up. Cheers! With warmer weather almost upon us, I wanted to make sure I got another stout under my belt while it’s still technically winter. I happened upon this particular brew while picking up beer for my I Am Providence review and couldn’t resist getting a six-pack of this as well. 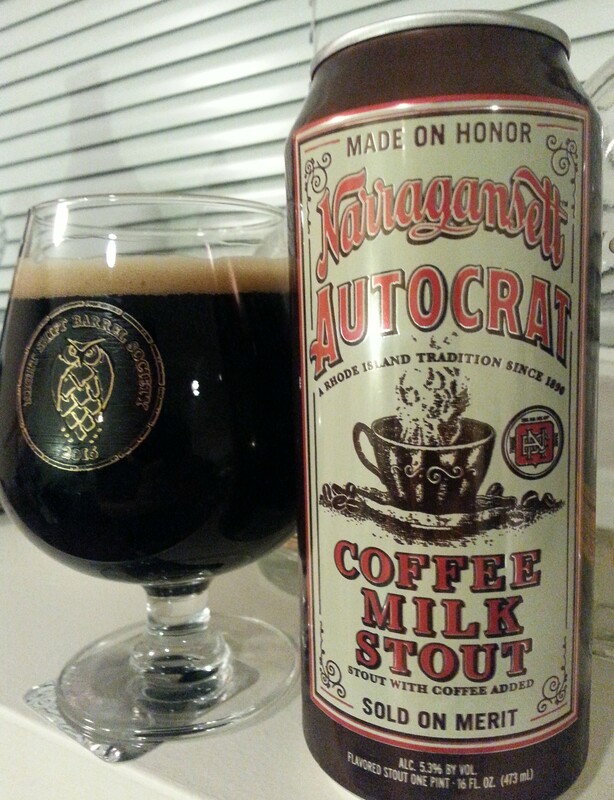 Description: This beer was the result of a collaboration between Narragansett and another long-lived Providence, RI company: Autocrat Coffee. You can get the details here. The six-pack of 16 oz. tall boy cans came at the very nice price of $8.50. Pour Info: Refrigerated 16 oz. can into my new snifter glass. Appearance: As expected of the style, this poured a deep, dark brown body with a thin tan head that mostly fizzed away. Smell: Light coffee smell as soon as the can was opened. Taste: It had a light yet steady coffee taste throughout that peaked towards the end. On the finish, the beer picked up a sweet creamy taste that blended into a hint of even more roasted coffee. Subtle yet flavorful. Mouthfeel: Smooth and creamy like you would expect for the style, but it felt a bit thinner than I was anticipating. Carbonation level was low. Hype Factor: Not much I suppose, but this beer did made a good impression on me the first time I had it about a year ago. It gets bonus points because that first time was during an impromptu visit to my old college drinking spot – the Blarney Stone in Worcester, MA. Overall: A good beer and another one that was quite satisfying despite not having over the top flavors. I was happy with this pickup, especially since it came at such a reasonable price. Fans of the style should do themselves a favor and check this out. The next item on my reading list for the year was Mort(e), by Robert Repino. Published in early 2015, I found out about this book after going through a number of sites counting down the best Sci-Fi/Fantasy books of 2015. The description sounded kind of out there, but the book kept showing up and something told me to give it a shot. Maybe I’m a sucker for cool looking cover art. The book is essentially about Sebastian, an ordinary suburban house-cat, caught in a battle between animals and the humans. The Ant Queen, Hymenoptera Unus, has declared war on humanity, and successfully rallied the other animals to her cause. As Sebastian makes a name for himself as the legendary warrior Mort(e), he finds his heart really lies with Sheba, the neighbor’s dog, who has gone missing. Still with me? It sounds kind of crazy when you type it out like that. To get into this book you have to accept the premise early on and go with it. If questions about things like how animals can (sometimes selectively) be transformed into humanized creatures and immediately take to using things like guns, cars, and cellphones are going to really bother you, you have come to the wrong book. There were a few times that I was ready to put this book down, but I managed to stick with it. Premise aside, the book had a somewhat drawn out start that made it tough to get into. The story’s peak in the middle was enough to keep me going, but that only provided sufficient momentum to take me through to an ending that really lost me. Aside from Mort(e), a rather likeable and relatable cat, the rest of the characters fell pretty flat and one-dimensional. They were for the most part interchangeable clichés of military personnel who, as you were routinely reminded, happened to be animals. To be fair, back stories were provided for most of the main characters, but these felt kind of forced and flimsy and didn’t do enough to endear me to anyone. The plot was similarly underdeveloped. I didn’t really feel any urgency for Mort(e) to find Sheba, and the quest felt more like a device to start the story and march it through to the end, rather than a meaningful tale of friendship. This is especially true once the story gets sidetracked into a military adventure. Also, the book’s two biggest messages failed to make an impact. Along the lines of Animal Farm, though without its cohesion or strength, one of the book’s main themes was that the animals may turn out as bad as the humans they were replacing; however, since the animals were humanized throughout and never shown to have aspirations to higher ideals, this revelation lacked substance. Similarly, the book’s religious theme fell flat and felt disconnected from the story as it was insufficiently developed and mostly incoherent. I think the author had something he really wanted to say here, but that message was ambiguous at best. As a regular Sci-Fi reader, I am definitely willing and capable of suspending disbelief to get into a story, but this particular one did not offer me enough to do so. So now I am left confused. Considering how I found out about this book, obviously a number of people out there liked it and it has met with some critical acclaim. If you’re curious or on the fence about this one, read some other reviews to help you make up your mind. One of the nice things about working in Downtown Boston is being in close proximity to the Fort Point location of Trillium Brewing Company. In the office we have a semi-regular policy of drinking a few beers at the end of the day on Fridays to help reflect upon the week that was and look forward to the weekend. What this usually means is that one of us takes the three-quarter mile walk to the brewery to get some growler fills. Yesterday was my day and I brought back some goodies. The first beverage of the afternoon was called Secret Stairs, described on the brewery’s website as a 6.5% “Boston” Stout. It poured about the way you would expect it to, black bodied with a fluffy tan head. The head eventually dissipated but remnants of it stayed around the top edges of the beer throughout. It had a nice slightly roasted dark malt smell, but the taste was where this one really excelled. The beer was rather flavorful without ever coming on too strong with any of the components. Upfront it offered a hint of sweetness and lightly roasted malts. The roast peaked in the middle with just the right amount to show itself. The finish was a subtle mix of sweet malts, roasted malts, and just a bit of cacao. There was a nice silky smooth, creamy thickness to the beer that suited it perfectly and kept everything together. Excellent beer, and at $8 for 32 oz. growler a great pickup. The second beer we tried out was an 8.5% DIPA named Speed Dial. According to the description, they made this as preparation for brewing a third anniversary beer. If this is any indication of what is to come, that anniversary beer is certainly going to be something special. 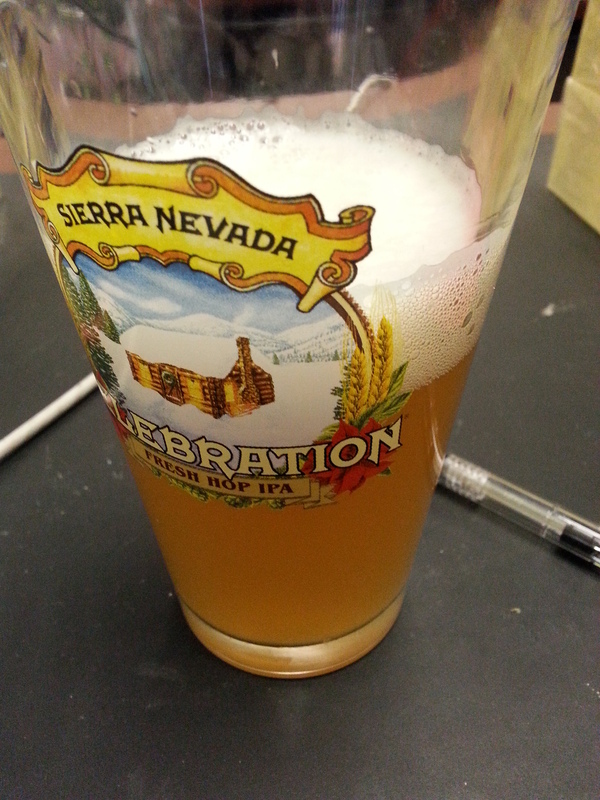 The beer started out with a golden-yellow/orangish hazy body on the pour topped off with a decent fluffy white head. The smell was fruity and juice-like as was the starting taste; I picked up mostly apricots and tropicals for both. On the ending there was a light tropical fruit bitterness that was quite a bit more subdued than I was expecting. Definitely no hop-bomb here. There was also a wheaty, dry aspect to the finish that also took me a bit by surprise. For the mouthfeel, this one was on the thicker side of moderate with a nice fluffy and creamy aspects. Overall, while this might not have been your typical super hoppy DIPA, it was quite good. $13 got us a 32 oz. growler fill. And that about wraps up that session. Seeing as we actually had work to do as well, we weren’t about to go opening up anything else. Cheers! I’m finally back, this time checking in with a very cool offering from Narragansett Brewing Company. Founded in 1890 this Providence, RI based brewery recently started a line of beers inspired by another Providence native born in 1890: horror writer H.P. Lovecraft. While I missed out on the earlier entries in the series, this one got my attention. Not only did it come out right around the time I was getting into a Lovecraft inspired text-based game, but the beer was an imperial red ale. The combination was too good to pass up. Description: The third installment in Narragansett’s line of beers taking inspiration from the works of H.P. Lovecraft. For this offering they brewed a hoppy red ale, the specifications of which you can find here. It was around $12 for a six-pack of 16 oz. tall boy cans. Pour Info: For the purposes of this review, I drank two of these: one poured into a snifter glass and the other straight from the can. Appearance: The beer had an amber body with a reddish gleam to it when held up to the light. A fizzy white head formed quickly on the pour and then steadily fizzed away. Smell: There wasn’t much to report in regard to the smell. Just a faint cotton-candy like sweetness that was a bit stronger coming from the can than the glass. Taste: Consumed from the glass, the beer had a sticky caramel malt sweetness upfront coupled with citrusy hops. It then transitioned to a more bitter and piney taste before coming to a resinous finish. Mixed in was a wheaty/yeasty character that seemed somewhat out of place, along with hints of alcohol. From the can, this beer was a bit more cohesive. The taste followed the same general pattern as it did in the glass, but the bitterness on the end wasn’t quite as pronounced and blended into the sweetness a bit more. The heat from the alcohol and yeasty/wheaty presence were still there, but much less discernible, making for a smoother drinking experience. I preferred it from the can. Mouthfeel: Sticky medium body with a moderate amount of carbonation. Nice and easy to drink, especially from the can where it picked up an almost creamy smoothness underneath the bubbles. Hype Factor: I suppose a release from Narragansett Brewing isn’t something most beer enthusiasts typically get super excited about, but as I said in the introduction, I had my reasons for wanting to try this. Overall: A pretty good beer, no more and no less. While it might not have been the hoppiest or maltiest of brews, it did strike a nice balance between the two that worked in its favor. Working against it were its tendency to get a bit too boozy for the style and the occasional feeling like everything didn’t quite came together as well as it could have. That said though, I’ll have no problems finishing my remaining cans and was happy I picked it up.